If pictures say a thousand words then flash the peace sign with some pizzazz. 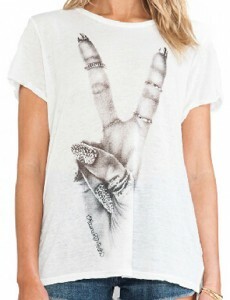 On the front of the shirt there is a woman’s right hand posing with a peace sign. The hand has glamorous nails and numerous rings on her fingers. This white short sleeve t-shirt’s bottom hem is shorter in the front and longer in the back. It is loose fitting which makes it great for any type of outfit. Sizes are Extra Small, Small, Medium, Large, Extra Large and 2 Extra Large. With all these sizes, it sure enough to make a gift for anyone even yourself. Build your peace, love and harmony collection with the Victory Print T-Shirt.